First thing this morning I scoured the web for any updates on the London Film and Comic Convention. As you may recall, I posted that Skyward Sword would be featured at the July 8th through 10th Con and my predictions were that there would be nothing new from Nintendo. Well, I found a post on Nintendo Scene detailing the Skyward Sword playable demo. The post is relatively short and describes two different areas that were available in the demo, a dungeon where you upgrade the beetle and a bird flying race. Those of you who followed E3 will recognize that these sound like the same demo’s from the 2011 Electronic Entertainment Expo. Jump inside to find out if they were the same or not. The Verdict: I’m pretty sure these London demos are the same demos from E3. I really wish there was something new to bring you, but unfortunately it looks like there is not. However, there is a very bright side to this story. If this Convention is any indication, it seems that Nintendo might be taking their E3 demo’s around the world. It would be really great if these demo units were to tour the States. I know I would love to get my hands on Skyward Sword, maybe later this summer at the Wizard World Comic Con in Chicago I’m planning on attending. That’s probably just wishful thinking, but it would sure be great! This video is not from the London convention, but is of a demo like what was at the Con. 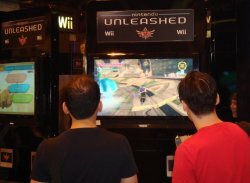 If Nintendo brought playable demo’s to a Convention near you, would you be lining up to check out Skyward Sword? Sound off in the comments below!